Commissioned for the opening of the Winspear Centre in 1997, Peter Hide studied the interior of the Winspear and played on its forms to create Full House. Hide is one of the world’s foremost practitioners of welded-steel sculpture, and has influenced at least two generations of artists in Alberta. 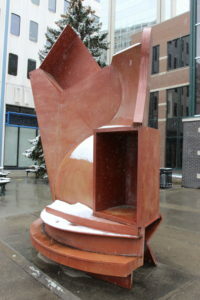 Playing off of the theme of the concert hall, the name of this sculpture refers to a sold-out “full house” concert. Biography: Peter Hide is an English-born artist who gained experience at Saint Martin’s School of Art in London where he studied under the modernist sculptor Anthony Caro. Hide is well-known for his large abstract sculptures made of welded steel. Hide taught at Saint Martin’s from 1971-78 before accepting a teaching position at the University of Alberta. His arrival in Edmonton helped further his career as Edmonton’s budding art scene gave him the flexibility to experiment and really settle on his own artistic style. Hide continues to teach at the U of A and create sculpture that he says has a focus on architecture.